Res judicata, also known as claim preclusion, is the Latin term for “a matter already judged. The doctrine prevents litigants from filing a second lawsuit to assert claims that have already been disposed of on the merits in an earlier lawsuit. See In re Mullarkey, 536 F.3d 215, 225 (3d Cir. 2008). It also bars claims that could have been brought in a previous action. Id. 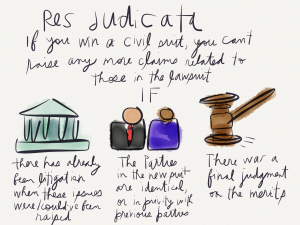 The legal concept of res judicata arose as a method of preventing injustice to the parties of a case supposedly finished, but perhaps mostly to avoid unnecessary waste of judicial resources. The doctrine of res judicata does not merely prevent future judgments from contradicting earlier ones, but also prevents litigants from multiplying judgments, and creating confusion. As the United States Supreme Court has explained, the doctrine of res judicata provides that when a final judgment has been entered by a court of competent jurisdiction on the merits of a case, it concludes and extinguishes the entire claim or cause of action in controversy. See Nevada v. United States, 463 U.S. 110, 129, 103 S.Ct. 2906, 77 L.Ed.2d 509 (1983); Cromwell v. County of Sac, 94 U.S. 351, 352-353, 24 L.Ed. 195 (1877). a later suit based on the same causes of action. Mullarkey, 536 F.3d at 225; Board of Trustees of Trucking Employees of North Jersey Welfare Fund, Inc., v. Centra, 983 F.2d 495, 504 (3d Cir. 1992). The doctrine of res judicata bars not only claims that were brought in a previous action, but also claims that could have been brought. Post v. Hartford Ins. Co., 501 F.3d 154, 169 (3d Cir. 2007). It “protect[s] litigants from the burden of relitigating an identical issue with the same party or his privy and . . . promot[es] judicial economy by preventing needless litigation.” Id. (quoting Parklane Hosiery Co. v. Shore, 439 U.S. 322, 327 (1979)). As the Supreme Court has explained, the doctrine of claim preclusion provides that when a final judgment has been entered by a court of competent jurisdiction on the merits of a case, it concludes and extinguishes the entire claim or cause of action in controversy. See Nevada v. United States, 463 U.S. 110, 129 (1983); Cromwell v. County of Sac, 94 U.S. 351, 352-353 (1876). Privity exists for purposes of res judicata where two parties represent the interests of the same entity, and this relationship may exist between a creditor and a trustee in some cases. See In re Dominelli, 820 F.2d 313 (9th Cir.1987). A party is considered to be in privity to a prior party when the party to the prior litigation represented the same legal right applied to the same subject matter. Jefferson School v. Subversive Activities Control Bd., 331 F.2d 76, 83 (D.C. Cir. 1963)(citing Hart Steel Co. v. Railroad Supply Co., 244 U.S. 294, 37 S.Ct. 506, 61 L.Ed. 1148 (1917)). As one federal jurist remarked: “privity states no reason for including or excluding one from the estoppel of a judgment. It is merely a word used to say that the relationship between the one who is a party on the record and another is close enough to include that other within the res judicata.” Bruszewski v. United States, 181 F.2d 419, 423 (3d Cir. 1950) (Goodrich, J., concurring), cert. denied, 340 U.S. 865, 71 S.Ct. 87, 95 L.Ed. 632 (1950). whether the material facts alleged are the same. Athlone Indus., 183 F.3d at 984. As demonstrated above, the doctrine of res judicata can be an effective defense to dispose of duplicate litigation filed over sour grapes. It’s application is a fact sensitive inquiry for a federal court to undertake. This article is for informational purposes only and is not intended to create an attorney-client relationship with LoFaro & Reiser, LLP. Nor is this article intended to be an exhaustive review of its subject matter.